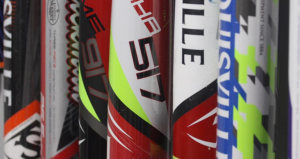 We recently spent considerable time in the cage with the new 2017 Louisville Slugger 517 Omaha. That direct analysis, combined with well over a thousand hours of writing, reviewing and researching performance single piece aluminum bats, goes into our 2017 Louisville Slugger 517 Omaha Review. We aren’t the only ones to have information about the 517 Omaha. Other places, in particular those who sell bats, usually have a boiler plate write up on the specs of a bat. Many of those we reference to make sure we are seeing what we should be. Here are some more references for the 2017 Louisville Slugger 517 Omaha review. Here’s who will like this bat: Prefers stiff one piece bats and are okay with a smaller hitting area; Likes the power that comes with a one piece bat; Wants to recreate the wood experience; Is looking for a value purchase in the performance space; Preferrs an aluminum barrel for its hot out of the wrapper performance. The major upgrade from the 2016 516 are an improved alloy for a lighter swing speed. We can confirm that. Additionally, while the physical barrel hasn't increased much (if at all), Slugger claims the usable barrel, due to an upgraded alloy, has also increased. This, in theory at-least, creates a larger sweet spot. There really is no way for us to confirm this. Another change from previous years is a custom Lizard Skin grip. The 515 Omaha from Louisville Slugger is the third of four bat in their 2015 top shelf bat line. The vast majority of big box store mass production bats are single piece alloy designs. However, few of them are designed to reach peak performance in terms of BBCOR and BPF standards. Within those few stands the 517 from Slugger. Two others come to mind: the 2017 Rawlings 5150 and the 2017 Easton HMX Speed. The 517 from Slugger is a single piece aluminum bat. It is a straight forward bat that doesn’t boast any new tech. It, after all, a bat. And they make no bones about it. From a pure weight and length perspective, few bats have more iterations than the 517 from Slugger. This is due, in large measure, to the bat’s success in terms of parent and player appreciation. Parents, we are assuming, appreciate the price point, and many players are perfectly happy with the bat’s performance. Such has been the case, and with the 2017 version, it looks like it will continue to be so.